The middle colic artery typically emerges by a common trunk along with the right colic artery. The middle colic vein trails the route of the middle colic artery. It drains the transverse colon inside the superior mesenteric vein. It splits within a left along with a right section after it travels in between the layers of the transverse mesocolon. The left branch anastomoses along with the ascending branch of the left colic artery. The right branch anastomoses along with the ascending branch of the right colic artery. 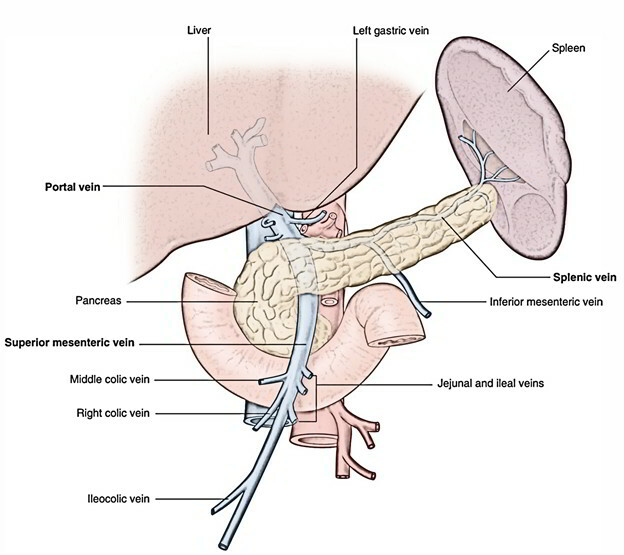 The middle colic vein moves in the transverse mesocolon near to the inferior boundary of the pancreas. This vein might be found while the dissection of the medial part. Likewise, the inferior mesenteric vein might be seen more laterally as it drains inside the splenic vein. Unneeded blood losses as well as increased operative time are the outcomes of unacknowledged middle colic and inferior mesenteric vein damage. The middle colic and inferior mesenteric veins might be ligated if they are hurt since there is an abundant network of collateral venous drainage tor the large intestine.